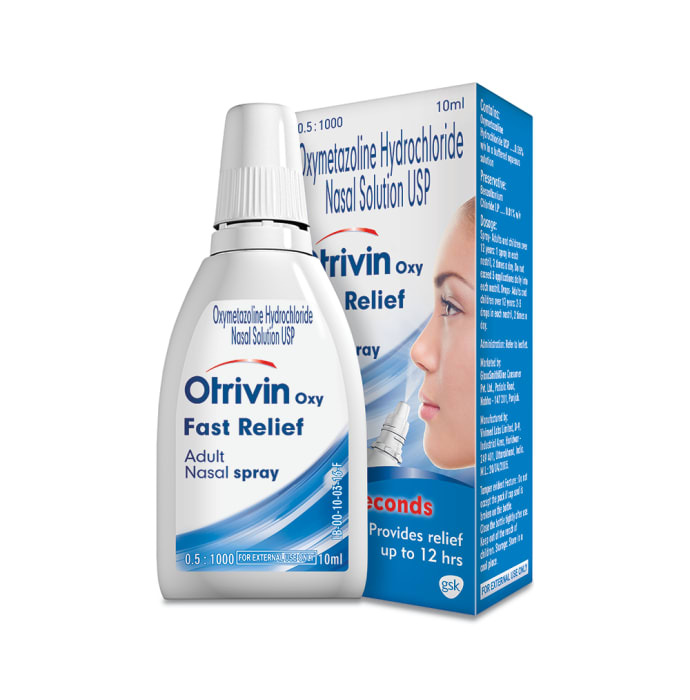 Otrivin Oxy Fast Relief Adult Nasal Spray helps in providing effective relief from the blocked nose. It is a fast acting formula which starts to unblock the nose in 25 seconds. It helps in reducing excess nasal secretions and relives the swollen blood vessels. Otrivin Oxy Fast Relief provides a long lasting relief and acts upto 12 hours. Sit comfortably with the spray bottle in your hand. Open the bottle and place the nozzle of the nasal spray just inside the blocked nostril. Squeeze the spray pack hard in the centre of the bottle and inhale deeply. Take a deep breath. Repeat for the other nostril and replace the cap after use. Adults and Children aged 12 years or more should spray once into each nostril, upto 3 times a day or, as directed by the physician. A licensed pharmacy from your nearest location will deliver Otrivin Oxy Fast Relief Adult Nasal Spray. Once the pharmacy accepts your order, the details of the pharmacy will be shared with you. Acceptance of your order is based on the validity of your prescription and the availability of this medicine.